Any commentary on Corgi cannot begin without mentioning the Mettoy Company which launched this world famous range of die-cast toys from 1956 to its demise in 1983. July 1956 saw the launch of Corgi Toys, but the story begins further back in 1933, when the founder, Mr Philipp Ullman, settled in England from Germany. 1933 - Philipp Ullman settles in England from Germany bringing with him 21 years of experience and knowledge of the toy industry. 6 months later Arthur Katz settles in England joining Philipp Ullman who had by now been given working space at Winteringham's in Northampton. 1934 - The first models produced were of "Tinplate". These formed the basic product range of the company which became Mettoy Limited (the name coming from its product, METal TOYs). 1936 - The Mettoy Company separated from Winteringhams on 29th February 1936. 1944 - Due to shortages of raw material ( because of World War II) the company joined the war effort and began producing all types of shell and mortar carriers. The heavy demand placed on Mettoy due to its war effort led to larger premises being sought and eventually found, in Swansea, in 1944. 1949 - Following the war, Mettoy expanded its facilities at its Swansea site and the new Mettoy factory was officially opened on 2nd April, 1949. Its main product was the Mettoy "Castoys" range in 1:35 scale with clockwork motors. 1950 - The first forerunners of Corgi were introduced and appeared in an illustrated catalogue as "Entirely New Miniature Numbers". This series was in 1:43 scale. 1954 - The first drawings for the new Corgi range were produced by Marcel Van Cleemput who had joined Mettoy earlier that year. Van Cleemput later went on to become Chief Designer. The first drawing was of an Austin Cambridge and following considerable pre-production work with the castings, development started to come together early in 1956. 1955 - The name Corgi was settled upon in late 1955 and was chosen from a list of about seventy names. The company held a competition for the name, but in the end the name of Corgi was suggest by Henry Ullman. There were various reasons why this name was chosen. First of all, it was the name of a sturdy little Welsh dog and the Corgi range was produced in Swansea, Wales. Secondly, the name of the breed was felt to be somewhat prestigious as the Corgi is the favoured breed of the Royal Family and their Corgi dogs were often featured in the media. Third, the name was short and snappy like the popular Dinky name. 1956 - The official launch date for the Corgi range was to be the 9th July 1956. But it was the firm of Playcraft Limited (a sister corporation to Mettoy before they both merged) that introduced the Corgi name to the world. Mettoy decided that to copy the Dinky product would not be enough to guarantee the success of the new range. It was agreed that all the vehicles in the Corgi range would have to have some "refinement" over the offerings of Dinky (their largest rival) and so all vehicles were fitted with windows. "The Ones with Windows" became a familiar phrase in the firm's early advertising slogans. Further innovation in the early models included the introduction of a flywheel mechanism that propelled the cars forward. Most models were available in 2 versions, one with the Mechanical Friction flywheel drive designated by an "M" suffix. 1957 - Corgi produced its first catalogue and undertook its first TV advertising campaign. This year also saw the release of the first gift set and in its first full trading year production reached nearly 2¾ million pieces. 1959 - The innovation continued and October saw the launch of #222-A, the Renault Floride, featuring windows, seats and interior panelling, steering wheel and sprung suspension. These feature soon became standard on all new models, and many of the older models were upgraded. 1959 also saw the introduction of a travelling Display Van to cover various trade shows and motor racing venues. 1960 - "M" models discontinued and "S" models introduced, S models had "Glidamatic" Suspension. The Chipperfields Circus range was first launched. The Proteus-Campbell Bluebird Record car was produced and a model was presented to Donald Campbell before his departure to the USA for the record attempt. 1963 - The Mettoy company invited subscriptions from the general public for the Company's Shares. It became a public company on 13th June. The issue was oversubscribed 2½ times. 1964 - To celebrate Mettoy's 30th Anniversary a new range of veteran and vintage models was introduced under the name of Corgi Classics. 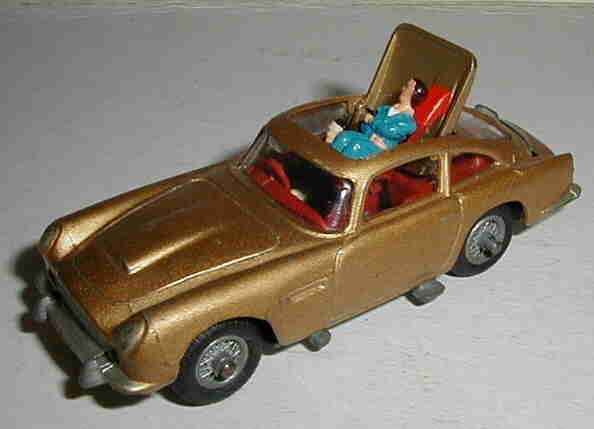 1965 - Together with the many new models that were now expected of Corgi, the company produced a particular model which would become the most universally known and remembered diecast model -#261-A "007 Aston Martin DB5". 1966 - Two prestigious awards were presented to Corgi (Mettoy) - the "Queen's Award to Industry" and the National Association of Toy Retailers "Highest Standards Award". 1967 - Almost 17½ million models were sold and Mettoy received its second "Queen's Award to Industry". 1968 - November 1968 saw the release of a model which is still very much sought today - "Chitty Chitty Bang Bang". 1969 - On the 10th March 1969 a fire broke out in Swansea and gutted the warehouse with the total loss of its contents and at least a year's stock of Corgi models. As a result a back-log of orders mounted and many retailers turned to Dinky to fill the gap. Phillip Ullman retired as Chairman and Director after more than 35 years with Mettoy. 1971 - An agreement was entered into with Fisher-Price to produce their range of toys for distribution in Europe. Philipp Ullman, President and founder of the company died. 1974 - £1.3 million was spent on new buildings, plant and tools as an extension to the existing Swansea site. 1977 - A 1902 State Landau was designed and produced to coincide with the Queen's Silver Jubilee celebrations. 1983 - Following more redundancies in Northampton the whole of the company's activities were relocated to Swansea. The design group ceased altogether. Since 1956 (a period of 27 years) the Corgi range grew dramatically, but in 1983 with the company in serious financial difficulties the receivers were called in and it was thought the last Corgi Toy had been produced. However, a management buy-out was eventually formulated and the company was re-formed as Corgi Toys Limited in early 1984. 1984 - Corgi Toys Limited was formed on 29th March 1984 from the assets of the former Mettoy Company. The buyout was led by Mike Rosser with financial support from Electra Investment Trust, the Welsh Office, Investors in Industry plc and Lloyds Bank. The new company decided to concentrate its efforts on producing and selling high quality diecast models. 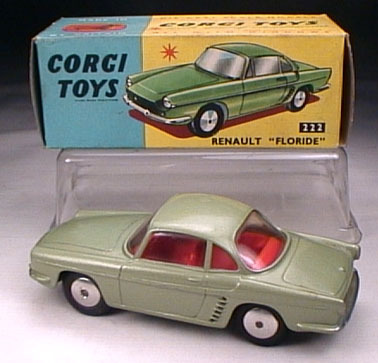 At the time of purchase, Corgi was rated number two in the UK diecast market. In the first year, Corgi set about winning back the confidence of the toy trade. The company appointed consultants to create a new corporate image with new packaging, a new logo and a revamped image. 1984 - Chris Guest was appointed Sales & Marketing Director and the company emerged as being marketing-led with a view to the 1980's and 1990's rather than a product-led manufacturer of the 1960's. The production area was also strengthened by manufacturing appointments at senior level and a continuing investment programme. Having concentrated its efforts during the first 2 years on regaining its market share in the UK, Corgi then turned to develop the overseas markets in both the toy and collector areas. Already exporting worldwide, extensive distribution arrangements were made, particularly in the USA and Australia and greater emphasis on the European markets was also realised. The collector market was encouraged through the introduction of a Corgi Collector Club with a worldwide membership. Corgi rapidly increased its market share and established itself as a leader in the competitive diecast toy market. The company's achievements were recognised in January 1987 when it was voted British Toy Company of the Year by the National Association of Toy Retailers. December, 1989 - Corgi Toys Limited was taken over by the US based toy company Mattel. Mike Rosser, Chief Executive for Corgi Toys Limited said that its Board had recommended the Mattel offer to Corgi shareholders as providing the best future for Corgi. 1990 - Production of Corgi Toys moved to China and the first Corgi model to be made in China was launched, the MGA in British racing green. January, 1991 - The Swansea factory and offices were closed and Corgi moved to Mattel's UK headquarters in Leicester. When Corgi became part of Mattel there was a lot of concern from individual collectors and trade alike that this would mean the end of the great Corgi tradition of faithful diecast modelling. There were even fears that the Corgi name would be dropped from the collector range and it would henceforth be branded Hot Wheels. Peter Eichorn (Executive Vice-President) attended the very first Biggest Little Motor Show, held at Telford in 1992. During his after-dinner speech at Telford, Peter immediately laid everybody's fears to rest by committing Mattel to the further development of Corgi. Mattel were true to their word. Their backing enabled Corgi to launch many successful new toys on a worldwide basis. Running alongside the traditional toy markets, the Classics range developed substantially during the first half of the 1990's. Particular emphasis was placed on commercial vehicles of the 1950's and 1960's - the age of nostalgia. 1994 - Corgi launched the Original Omnibus range, with its 1:76 scale commercial vehicles designed to complement OO gauge railway layouts. The same year, the company invested in new tooling aimed at the American market featuring commercial vehicles, fire vehicles and coaches (buses). The 1990s also saw Corgi re-entering the world of TV and films, with successes such as Mr Bean's Mini, the Inspector Morse Jaguar and the Morris Minor from Some Mothers Do 'Ave 'Em. Significantly increased investment in tooling, limited editions, authenticity and a great attention to detail resulted in record demand and collectability. It is these factors which drove Corgi to its position today. August, 1995 - On the 7th August, after five years of ownership by Mattel, Corgi was back in private hands following a management buyout led by Chris Guest and venture capitalist Cinven. The connection with Mattel was finally severed when the new Corgi Classics Limited moved from the Mattel building into new premises, just a ½ mile away on the Meridian Business Park, Leicester, on 23rd October 1995. Saturday 24th June 1995 was another landmark in Corgi's history when the first ever Corgi Heritage Centre was opened to the public. The centre is a joint venture between Corgi Classics and Chris Brierly of Chris Brierly Models in Heywood, Lancashire. It was officially opened by His Worshipful the Mayor of Rochdale, councillor Rodney Stott. He and the Lady Mayoress arrived in appropriate style in a Bristol LG5 vintage bus in North Western Livery, kindly loaned by the Greater Manchester Museum of Transport. Steve Berry from BBC TV and radio programme Top Gear also came to have a guided tour of the museum, displays and large Corgi retailing area. 1996 - During 1996 expansion continued with the purchase of the Basset Lowke property and tooling and the launch of the First Corgi Collector Centre. Corgi also secured licences for the Beatles and Mr Bean products and launched the Hong Kong Product Range. 1997 - This year saw the launch of the French Collection Heritage product range and the establishment of the Toy and Gift Division. The Corgi Collector Centre roll out continued and the Cadbury licence was secured. 1998 - Corgi moved to direct sourcing of production in Hong Kong and the Aviation Archive range was launched. ICON figurines were developed and the Corgi Collector Centres now stood at 35 locations. Licencing for the Guinness range was secured. October, 1999 - The latest chapter in the history of Corgi Classics Ltd was written with the company’s acquisition in October 1999 by US collectibles specialist and Nasdaq listed company, Zindart. Corgi’s incumbent management team was retained under the new ownership and continued to identify and pursue new openings in the collectibles and toy markets. Zindart introduced new investment and presented further opportunities for Corgi to apply its collectibles expertise to the US markets. Corgi introduced a dedicated Sales & Marketing operation based in the USA and looked to establish a firm foothold in the US. Corgi’s acquisition of the UK die-cast collectibles company Lledo, including all its tooling plus the highly respected Vanguards and Days Gone ranges, further strengthened Corgi’s offering in the die-cast model car sector. Other noteable events for Corgi during 1999 included the launch of ICON Figurines and the German Product Range. Collector Centres stood at 45. 2000 - Early in the new Millennium Corgi Inc. Sales and Marketing operation was established in the USA and a licencing deal secured for Noddy from Enid Blyton. 2004 - George Volanakis joins the company as CEO after 30 years in the toy industry. Corgi secures a global licence from Warner Brothers to produce models inspired by DC Comics' Batman comic series. 2006 - Corgi celebrates its 50th Anniversary.